This CNC BALLSCREW CONVERSION KIT is made in the U. I THANK YOU IF YOU ARE CONSIDERING MY GRIZZLY G0602 , G0752 CNC BOLT ON BALLSCREW KIT. Listing reflects different customer motor setups. 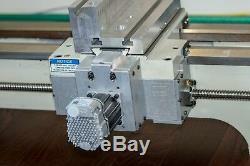 LATHE , ELECTRONICS & STEPPER MOTORS ARE NOT INCLUDED AND ARE FOR DEMO ONLY! 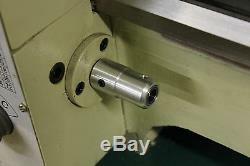 This Bolt on X & Z Axis ballscrew kit is designed and built by BDTOOLSUSA to convert your Grizzly G0602 or G0752 , 10 x 22 manual lathe to CNC using the mounts and ballscrews supplied in this listing. All parts are Custom made to assure proper fit and are designed to install into the original Mounting holes. 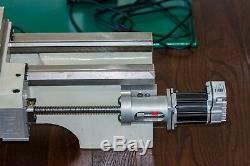 You have NO holes to drill or tap and NO modification is needed to your lathe to install this kit. I have designed this kit to come to you already assembled and can be installed with minor difficulty. 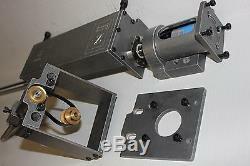 A Both X and Z Axis come with linearmotionbearings. B The Gecko 540 Controller used in my videos with Mach3 software worked Great even with the 270 oz motors , so anything larger would just be better up to a 3/8 max Dia. All Custom made Aluminum parts come to you with a Great looking Machine finish as is and any other screws required are included in the Kit. 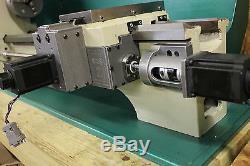 The X axis comes with a 1 to 1 Belt Drive Ratio that is completely enclosed. This unit uses Angular Contact Bearings in its newly designed mount. 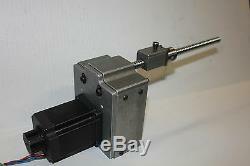 Shown with a Nema23 270 oz StepperMotor which shows easy movement and proper function. This stepper motor was for demo only and can be increased to suit your needs. The Nema23 motor plate is slotted for easy belt adjustment up front and only takes a second if needed. The X axis will install into the original holes along with the original screws without removing the cross slide or the Gibb. 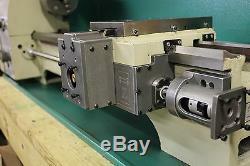 The Z axis is a Direct Drive setup that also uses Angular Contact Bearings along with a OldHam style 3/8 I. It will come assembled ready to install into original holes with minimum effort. This kit is shown with Nema 23s 270 oz motors in the videos , and you can increase to your desired motor size up to a 3/8 dia. This kit was crafted with care by an experienced tool and die maker to provide you with years of service and make useful parts on a really great little machine. You will not be disappointed in the quality of this kit The kit will include all mounting block hardware necessary for installation. STEPPER MOTOR IS FOR DEMO ONLY AND IS NOT INCLUDED. 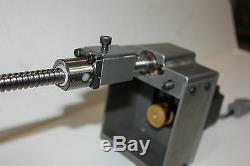 The item "CNC LATHE BALLSCREW CONVERSION KIT FITS THE GRIZZLY G0602, G0752 10X22 LATHES" is in sale since Friday, March 29, 2019. 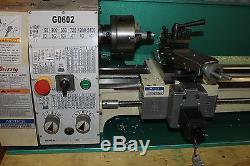 This item is in the category "Business & Industrial\CNC, Metalworking & Manufacturing\CNC & Metalworking Supplies\Other CNC & Metalworking Supplies". 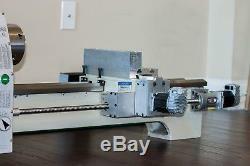 The seller is "bdtools" and is located in Greenwood, Louisiana. This item can be shipped to United States, Canada, United Kingdom, Denmark, Romania, Slovakia, Bulgaria, Czech republic, Finland, Hungary, Latvia, Lithuania, Malta, Estonia, Australia, Greece, Portugal, Cyprus, Slovenia, Japan, China, Sweden, South Korea, Indonesia, Taiwan, South africa, Thailand, Belgium, France, Hong Kong, Ireland, Netherlands, Poland, Spain, Italy, Germany, Austria, Bahamas, Mexico, New Zealand, Singapore, Switzerland, Norway, Ukraine, Croatia, Malaysia, Brazil, Chile, Colombia, Costa rica, Panama, Trinidad and tobago, Guatemala, Honduras, Jamaica, Barbados, Bangladesh, Bermuda, Brunei darussalam, Bolivia, Ecuador, Egypt, French guiana, Guernsey, Gibraltar, Guadeloupe, Iceland, Jersey, Cambodia, Cayman islands, Liechtenstein, Sri lanka, Luxembourg, Monaco, Macao, Martinique, Maldives, Nicaragua, Peru, Pakistan, Paraguay, Reunion, Viet nam, Uruguay.